Raynaud's Disease - body, causes, Keyword, What Is Raynauds Disease? Raynaud's disease is a disorder in which the vessels that supply blood to the fingers and toes (the digits) contract, causing the fingers and toes to turn white, feel numb, tingle, or burn. In this condition, the arteries that supply blood to the fingers and toes respond to cold or other stimuli by going into spasm (contracting), reducing the supply of blood to the digits and turning them white. When there is no specific reason found for this contracting, the condition is called Raynaud's disease. It can appear at any age, but it occurs most often between the ages of 20 and 40 and affects females more than males. Raynaud's phenomenon has the same symptoms as Raynaud's disease, but its cause is known to be another disease. Diseases that can cause Raynaud's phenomenon include rheumatoid arthritis, systemic lupus, and scleroderma, which are all chronic (long-lasting) disorders of the connective tissue * . Other possible causes include atherosclerosis (in which large arteries are blocked by fat deposits) and Buerger's disease (in which small arteries in fingers and toes are blocked by inflammation). People in certain occupations are at higher risk for Raynaud's phenomenon. Anyone whose work involves the constant and repetitive use of the fingers or who uses tools that vibrate, such as a jack hammer or chain saw, are at increased risk. People with medical conditions that affect small arteries, have certain neurological conditions, or connective tissue diseases such as lupus or scleroderma, are at risk as well. Smoking may trigger or worsen spasms in blood vessels. What Are the Symptoms of Raynaud's Disease? 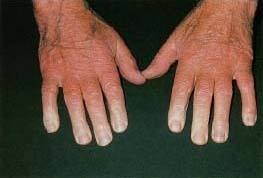 An elderly man has whitened fingers from Raynaud's disease. His fingertips are white because the arteries are constricted, which cuts off blood supply and causes numbness and tingling. In Raynaud's disease, a person's fingers and toes first turn white or blue when they become cold because the necessary amount of blood is not reaching them. When they turn red it is a sign that blood is flowing normally again. * connective tissue, which helps hold the body together, is found in skin, joints and bones. When people get an attack of Raynaud's disease, their fingers and toes may feel numb or tingle and burn. In severe (but rare) cases the restriction of the arteries causes the fingers to thicken, which can lead to ulcerations (loss of tissue) at the finger tips as well as changes in the fingernails. In the worst case, gangrene (tissue death) can occur. Raynaud's disease can be effectively treated with medications that prevent the constriction of the blood vessels. Some ointments or creams can also be prescribed to soften the skin, though this will not help to prevent attacks. The doctor diagnoses the condition by taking a careful history from the patient. Advice on preventing flare-ups of Raynaud's can help the person avoid further episodes. In severe cases, surgery may be required to cut the nerves that control the contraction and dilation of the blood vessels. How Can Raynaud's Disease Be Prevented? Stop smoking. Cigarettes constrict (close up) blood vessels. Avoid high-risk activities. Vibrating machinery, like pneumatic drills and chain saws, can trigger an attack of Raynaud's disease. Excessive typing and piano playing also involve repetitive finger motion and can trigger the disease. Avoid substances that are known to trigger Raynaud's. Polyvinyl chloride (PVC) and other substances may trigger an attack. Wear layered clothing to retain warmth, since exposing the face or forehead to cold can trigger an attack. Wear gloves or mittens to protect against cold.